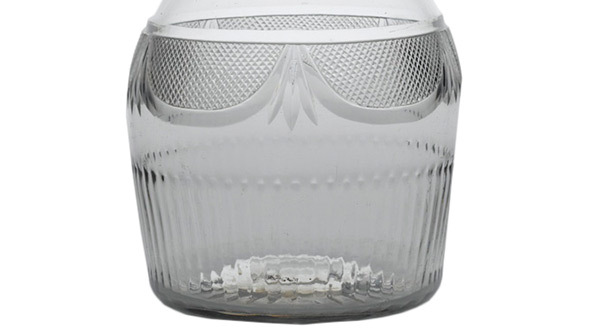 This glass decanter is striking for its elegance of form and luxurious, almost sensual curves. Its applied cutting is a variant of the more typical style of semi-circular pendant arch motif, with a star underneath and pillars running around it—typical of the work of the Penrose glass factory in Waterford. It also tells a poignant story: the flowering of an Irish industry in the two decades before the Act of Union and its withering after. The Penroses were representative of the more dynamic, entrepreneurial side of Anglo-Ireland. With roots in Cornwall, they moved to Ireland in 1656, by which time they may already have been Quakers. William Penrose established himself in Waterford in the early-eighteenth century as a tanner and merchant, and his son, also William, founded the Waterford Glass Factory in 1783. It cost £10,000 to establish and employed between 50 and 70 workers, especially cutters and engravers. 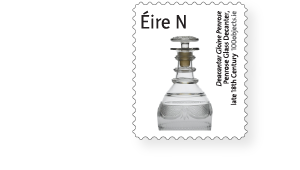 It can be seen as an excellent example of positive Anglo-Irish relations: the immensely skilled John Hill, who oversaw the process, was a Quaker brought from Stourbridge, in Worcestershire, taking eight or ten of the ‘best set of workmen’ with him.Their skills, passed on to Irish workers, quickly earned Waterford glass a high international reputation: Penrose products were sold in the United States, Canada, the West Indies, France, Spain and Portugal. Irish-made glass, including that from Waterford, also began to replace imports. The Penrose factory was made possible by the lifting of English prohibitions on the export of glass from Ireland and of duties on coal used for its manufacture in the dynamic 1780s. The Act of Union should not have interfered with the business, which was carried on by Jonathan Gathchell after the Penroses gave it up on William’s death, in 1799. Initially, indeed, the glass industry continued to thrive in Waterford, Cork, Dublin, Belfast and Newry. Westminster, however, often proved indifferent if not hostile to Irish commercial interests. In 1811 flint glass made in Ireland and exported was made liable to duty; in 1825 a very heavy excise tax was imposed on glass manufacturers, which devastated the industry in Ireland. Ireland had eleven glass factories that year, and by 1852 it had only two: one in Belfast and one in Dublin. The Waterford glass factory had closed in 1851. In the previous decade overall employment in the making of pottery and glass in Ireland had fallen by 45 per cent. The decline of the glass industry is part of a larger pattern: the failure of Ireland under the union to catch up with the British industrial revolution. If anything, Irish industry declined. Historians dispute the causes and nature of ‘de – industrialisation’, and it was a gradual process. What is clear is that industrial employment became increasingly dependent on the textile sector, which was heavily concentrated in the north. In 1841 about 32 per cent of the labour force was in industry, but of the industrial workforce, about two-thirds were in textiles, chiefly linen. Unity with a great industrial power did not prevent Ireland beyond Ulster from becoming, over the course of the nineteenth century, a more agricultural society.